With soothing, pain-releasing action, feverfew is an age-old medicinal ingredient used by the learned physicians of the ancient Greek and Roman civilizations. Learn more about this beloved healing herb to better understand its present-day significance. Legend has it that common feverfew came to be known as "Parthenium" after an herbal treatment was used to save the life of a man who had fallen from the Greek Parthenon during its construction in the 5th century BCE. Modern research, having supported many of the claims about its health benefits, is at least partially responsible for why the herb remains so highly treasured to this day. Reducing inflammatory pain. Feverfew is known for its inhibitory effect on inflammation, and early evidence seems to suggest its usefulness in fighting arthritis and rheumatism. Relieving migraines. 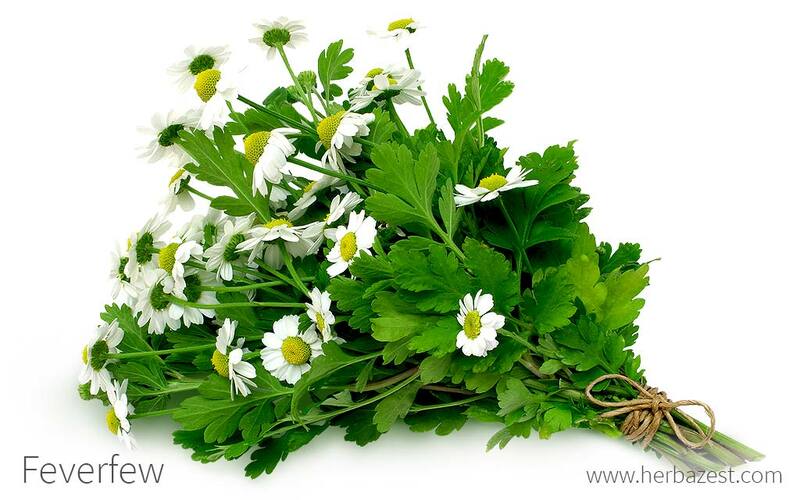 If ingested as soon as symptoms appear, feverfew provides pain relief to sufferers of migraines and severe headaches. Alleviating menstrual cramps. A natural pain reliever, feverfew is often applied to the treatment of menstrual cramps and may also help induce menstruation in women. Treating skin ailments. Early research indicates that feverfew may help to improve the appearance of the skin by reversing cellular damage. Lowering fever. As its name suggests, feverfew may help to lower high body temperature. The feverfew plant contains a wide variety of natural substances, including sesquiterpene lactones, flavonoids, and volatile oils. Of these, the compound parthenolide is considered the most active. While researchers are still trying to identify feverfew's key mechanisms, parthenolide appears to lower the frequency and severity of migraines through its inhibitory action on the hormone serotonin. Some research shows that by interfering with the production of key inflammatory substances in the body, feverfew helps to lower pain and swelling. It may also prevent muscle spasms by blocking open potassium channels. Analgesic properties are also present in aspen and honeysuckle, whereas ginger and turmeric provide similar anti-inflammatory benefits. Feverfew is mostly safe for oral consumption and topical application; however, discontinuing use after long-term treatment may lead to problems with headaches, stiffness, anxiety, or difficulty sleeping. Feverfew can also act as a contact allergen, triggering skin or mouth irritation in sensitive individuals. Feverfew may increase the likelihood of heavy bleeding when taken in conjunction with anticoagulants or other prescribed drugs. Pregnant women are likewise discouraged from consuming medicinal doses, which can trigger uterine contractions and upsets. Since individual cases may vary, it is important to speak with a medical provider about the role that feverfew could play in one's healthcare regimen. Because of its somewhat bitter flavor, feverfew's food uses are rather limited. However, while the dried flowers give flavor to some pastries and other dishes, feverfew leaves give herbal teas a distinguished taste. With a higher concentration of the herb's active ingredients, medicinal formulations are among the most useful preparations for consuming feverfew. Feverfew's leaves and flowers are the primary plant parts used to prepare herbal remedies. They can be used both orally and topically, according to the desired effect. Tea. Warm infusions and decoctions made from the feverfew plant can be used to ease muscle pain and lower inflammation following overexertion of the body. Tincture. When consumed in a dosage of 60 drops, these concentrated feverfew extracts can help to lower fever and ward off infection. Salve or ointment. Feverfew salves and ointments are applied topically to heal unsightly skin problems and to stimulate cellular regeneration. Oil. Extracted from the newly-harvested leaves and flowers, feverfew oil may be used in cosmetics or as a massage treatment for stiff muscles. Capsules. Made using the dried and crumbled feverfew leaves, capsules are usually taken for long-term migraine prevention, and may be combined with other useful herbs. Because it has rather minimal culinary use, harvested feverfew leaves and flowers are extremely difficult to come by in normal grocery stores and supermarkets. However, with early research, it is possible to purchase fresh feverfew plants or dried parts from home growers, local plant nurseries, herbalist stores, and many online vendors. In the past few decades, thanks to modern research and technological advances, all-natural supplements made from feverfew have become widely available on the commercial market. Specially formulated with high concentrations of feverfew's active ingredients, they are available for purchase at a number of natural health stores, pharmacies, drugstores, and online retailers. Indigenous to the regions of southeastern Europe, feverfew has enjoyed notable success in recent years, and has now been naturalized throughout Europe, Australia, and the Americas. Although it is often found growing wild along woodland borders, roadsides, and waste places, feverfew can be successfully cultivated in the home garden. Propagated from seeds or via root cuttings, feverfew is best planted in an area that receives direct sunlight all throughout the day. While it certainly tolerates a range of different growing conditions, feverfew grows best in medium, well-drained soil that is maintained at a pH level of between 6.0 and 6.7. Plants are spaced at a distance of between 8 - 12 inches (20 - 30 cm) apart. Targeted cultivation practices may be required to protect young feverfew plants from invasive weed populations. Feverfew suffers from very few insect problems, but may be susceptible to spider mite colonies. Because feverfew is a rampant self-seeder, deadheading is a recommended at the end of each growing season. Consisting of long, branching stems and green, toothy leaves, feverfew plants grow to an average of 1.0 - 3.2 feet (30 - 100 cm) in height. Beautiful flower blossoms appear in July, and look similar to those of a daisy, with soft white petals surrounding a bright yellow center. Feverfew is frequently referred to by its botanical classification, Tanacetum parthenium. It is a member of the large Asteraceae family, which includes some 25,000 species of flowering plants, such as artichoke (Cynara cardunculus), chamomile (Matricaria chamomilla), dandelion (Taraxacum officinale), and milk thistle (Silybum marianum). Spread out across 1,500 genera, plants of this family are known for their complex inflorescences, which are made up of hundreds of minuscule florets that appear as one. 'Snowball'. This is a double-flowering feverfew variety, so called because it has twice as many white petals as common feverfew. 'White Pompom'. With very long stems that are perfect for harvesting floral arrangements, this heavy-blooming variety has a lower concentration of parthenolide. 'Flore Pleno'. This is a double-flowering feverfew with a tiny yellow disk. 'Golden' or 'Aureum'. As its name suggests, this dwarfed cultivar is known for its goldish leaves. It grows no taller than 12 inches (30 cm) usually. Considered by many historians to be a potent medieval aspirin, feverfew was used by ancient Greeks and Romans for pain and fever relief. The 17th-century British scholar Nicholas Culpeper upheld the herb's value in treating miscarriages, colic, and opium addictions. In his 1653 handbook, The English Physician, he contends, "[feverfew is] a general strengthener of [the] womb...and doth the woman all the good she can desire of a herb." Thus, cultivating feverfew for its healing powers is nothing new. However, it wasn't until the 1980's that feverfew would pique modern scientific interest. A 1983 study concluded that 189 of the sampled 270 frequent migraine sufferers reported fewer and milder migraines with feverfew treatment. Having proven its efficacy where, for many people, conventional medicine had failed, this sparked a new wave of clinical studies about feverfew. Each year, Americans spend an estimated $1,757 per person on episodic migraines, and nearly $7,750 on frequent attacks. In recent years, feverfew has emerged as one of the leading herbs for chronic migraine prevention, asserting itself as an important and inexpensive alternative source of care. Gardening. A delight to behold, feverfew's attractive, daisy-like flower blossoms can be grown for pure ornament in the home garden. Insecticide. Also, believed to hold effective insect-repellent properties, it is sometimes made into products and home remedies intended to protect pets from run-ins with irritating pests. Feverfew is a slow-growing, low-maintenance herb with a long history of use in natural medicine. With soothing anti-inflammatory and pain-relieving properties, feverfew makes a wonderful addition to any home garden or alternative healthcare regimen.